Wireless Bluetooth earbuds are great for exercise—that is, until the battery conks out in the middle of a workout. 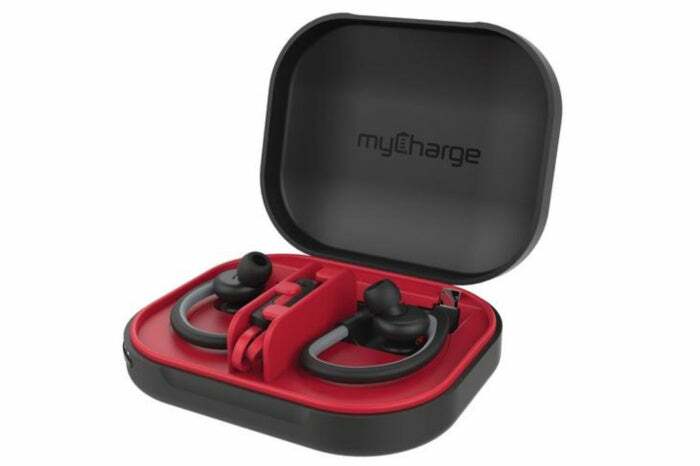 If this sounds all-too familiar, myCharge has come up with a unique solution to keep earbuds recharged while protecting them at the same time. 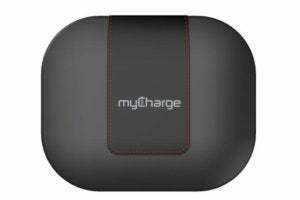 myCharge PowerGear Sound ($33 on Amazon is a protective charging case designed for wireless Bluetooth earbuds. As the name suggests, the case is marketed as an accessory for Beats by Dr. Dre’s popular Powerbeats lineup. However, the case is actually dual-purpose. The custom Powerbeats tray can be removed and used with any brand of earbuds. I don’t own any Powerbeats, but the top tray worked just fine even with inexpensive Mpow Seashell earbuds, snaking the cable through the center clip and snugly securing its control bar in place. At 4.2 x 3.5 x 0.9 inches, PowerGear Sound is too bulky to be considered pocket-friendly, but the hard glossy black clamshell is well-made and latches closed with a satisfying snap. The interior trays are red, which complements the stitched rubber crowning the exterior of the case. Rugged protection is just one reason to invest in PowerGear Sound. Tucked inside the bottom of the case is a 1000mAh battery capable of quickly topping off an attached pair of earbuds up to 10 times from a single charge. I don’t use earbuds daily, but my initial charge is still going nearly two months after receiving the device. The earbuds attach to an integrated micro-USB cable inside the case, which thoughtfully has an angled end and provides 5V 1.0A output, enough to top up most smartphones, including an iPhone (with the appropriate Lightning adapter, of course). The internal battery is charged from a covered micro-USB port on the outside of the case—a ridiculously short three-inch cable is included, but any will work—and a button on the corner illuminates four LED battery indicator lights to show how much juice remains. 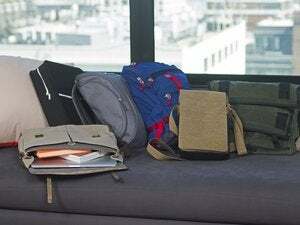 This is a slick package, and if your Bluetooth earbuds frequently run out of gas, this is a great way to charge and carry at the same time. While the case itself is pretty lightweight (about five ounces), there’s nowhere to attach a loop or carrying strap. It’s also a little expensive, twice as much as my aforementioned inexpensive earbuds. myCharge PowerGear Sound offers rugged protection and ample juice for charging wireless earbuds multiple times, but it’s a little bulky to carry on the go. 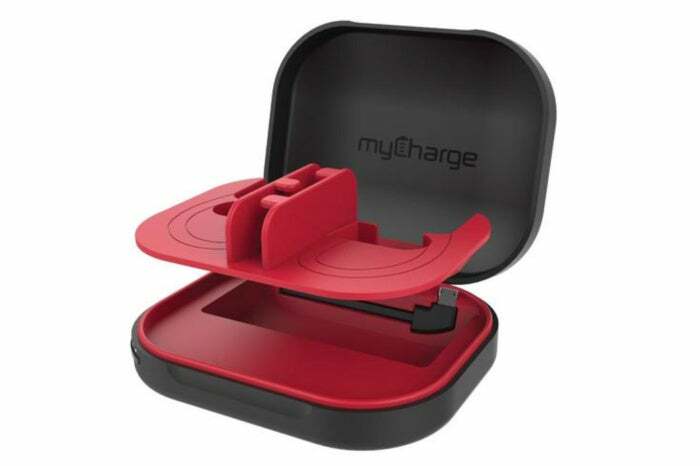 myCharge PowerGear Sound provides clamshell protection for Powerbeats or other wireless earbuds, along with an internal battery with enough juice to power them for weeks before needing to recharge.